The Best Beginner’s 5K Training Plan: Building a winning habit with easy every day runs. The best 5K training plan for beginners is simple, and addresses the hardest part about doing it: Yourself. If you’re not a runner but you want to run a 5K, there’s a multitude of training plans you can follow over 8-12 weeks to get ready. The most popular is Couch to 5K, where you follow a run/walk approach 3 days a week and build up to running 3 uninterrupted miles by week 8. Almost every beginner plan has you run 3-4 days a week, every other day. As I mentioned in a recent post, what derails you on these plans is (somewhat ironically) the scheduled days off. Intended to help you recover, the days off instead tempt novices back into their old habit of not-running, and prevent running from becoming a repeatable, sustainable habit. It ironically takes more discipline to maintain a half-time running schedule over time than it does to maintain an every-day running habit. Though starting an everyday running habit is more of a grind in the short run, you more quickly ingrain running as a repeatable habit. It becomes easier to continue training. Meanwhile, if you’re taking a day off every other day, not to mention a full weekend off each week… it’s very easy to forget or give in to temptation, and skip the next workout. And the next. And eventually quit running. This is because you’re not building a repeatable habit. You do a workout one day, but then do no workout the next day. Imagine if instead of brushing your teeth every day, you brushed them three times a week. Chances are pretty good you’d forget to brush your teeth a lot more often doing it three times a week. However, brushing them everyday quickly ingrained the action as a habit, and you do it without a second thought. This is the power of habit. And it’s the key to conquering your inertia towards exercise, let alone towards training to run a 5K. The key isn’t just to train yourself to run 3+ miles without stopping. The key is to build the habit of running so that it’s easier to get you to do the workouts you need. The vast majority of New Year’s resolutions fail within three weeks. People fall back to the old habits they’re trying to break, habits built over a lifetime. I’m not the guru on habits that others are. To learn more about how habits form and can get formed, you may want to read up from others who specialize on the subject. James Clear just released a great new book on the subject called Atomic Habits, full of actionable advice and tips on how to form and maintain positive habits. Clear’s also written some great articles on the subject that are worth a look. One of the classics on human habits is Charles Duhigg’s The Power of Habit, a fascinating narrative of personal cases that revealed how the brain is wired to form and follow habits. Even people who suffer permanent brain damage and lose memory still retain old habits. Definitely worth a look. That said, a lot of people take up an exercise goal as a resolution. Gyms get their most signups during the New Year. The gyms are crowded for a few weeks, then people flake off. Ditto the trails on the weekends, as people decide to start running. I won’t go as far as to call the Lakefront Trail “amateur hour” (that’s Wrigleyville during peak drinking hours, to be honest). But there’s a lot of newcomers during the first few weekends in January. 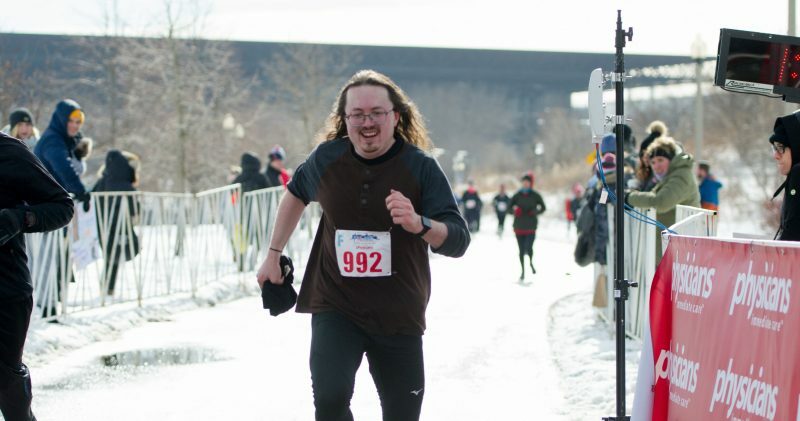 Then the pull of old sedentary habits (not to mention intimidation from the cold!) keeps them from coming back once February rolls around. So you want to start running as your resolution? Or come back to running? You want the habit to stick beyond Martin Luther King Day? Or you decided on a whim to register for a spring race like the Shamrock Shuffle and now you’ve got to train for it? You absolutely need to run slow. Slower than you think. Run as slow as you need to in order to keep running. As a newcomer to running, you will struggle to run for any amount of distance, and chances are likely you will quit early unless you first focus on running far as slowly as you can get away with. A parallel: Competitive walking has a rigid set of rules that constitute what exactly constitutes a walk, and it’s a good guide for the minimum of what you need to do for your movement to qualify as a run. A key point in race walking is that your back foot must be on the ground until your front foot plants on the ground. Conversely, if your back foot comes up before your front foot impacts the ground, then you are technically running. See how slowly you can get away with safely doing this, and you may be surprised how slowly you are allowed to run. Another key reason you want to run slow is to make it easier for you to run without having to hit the ground hard. A telltale sign that a runner is outrunning his/her normal capabilities is that their feet hit the ground hard and loud. This isn’t just aesthetically displeasing, but it’s not healthy. You’re jarring your joints, muscles and ligaments all the way up the chain from your feet up into your core, and risking long term injury. In fact, this is largely where common runner ailments like shin splints and IT band pain come from. You basically just stress those parts of your body until they hurt. In dance and some theatre circles, performers get taught how to step as softly as they can. There’s usually no real method taught to this, but performers often work at it until they develop the locus of control to step softly. I guess it incidentally helped that I studied theatre and dance before becoming a serious runner, as learning this inadvertently, eventually helped me develop better running form. But you don’t need to dance or do theatre to learn to run soft and easy. Stand up. Find some open space. Take a step forward as softly as you can. Take another step forward as softly as you can. Repeat. Take your time and relax while repeating this. You may find that your body naturally moves and adjusts with you. Eventually your body just knows how to move to comfortably make it work. It also probably feels silly to do, but work with it. Now try to do it quickly, but stay as relaxed as possible. Do it consistently and quickly enough, and all of a sudden you’re running that way. It may not be fast or intense, but it works. The home run trot that I previously advocated is basically just this. It’s exactly what baseball players are doing. They’re just running as easy and comfortable as possible. Their feet are definitely not slamming into the ground. Recovery is something even experienced runners aren’t great at doing. Most don’t think at all about taking in nutrition within two hours of running, or realize that the half hour after running is a valuable window for refueling the body. While carbohydrates may be valuable for glycogen restoration, what you do need for sure is protein. You just did a bit of damage to your muscles, and they need protein to rebuild. Consume at least 15-30g of protein. I’m not saying you should pig out. Just eat a protein bar, some nuts or seeds, or drink a glass of milk, if nothing else. If you are in fact planning to eat a meal like breakfast or dinner right after running, great. Mission accomplished. I can get into all the science as to why processed junk doesn’t help you as much as whole food, but in a nutshell you’re better off eating something healthy. If you’re in a bind and options are limited, then eat what you must. But given the option, try to eat whole foods in as close to their natural form as you can. How well you bounce back between workouts is largely a function of how you recover. What you eat or drink soon after the run matters.